New to market, this two-story duplex in Waimea checks a lot of boxes. For starters, it’s in quaint Waimea, the largest town in North Kohala, with lots of shops, schools, and community and cultural events. 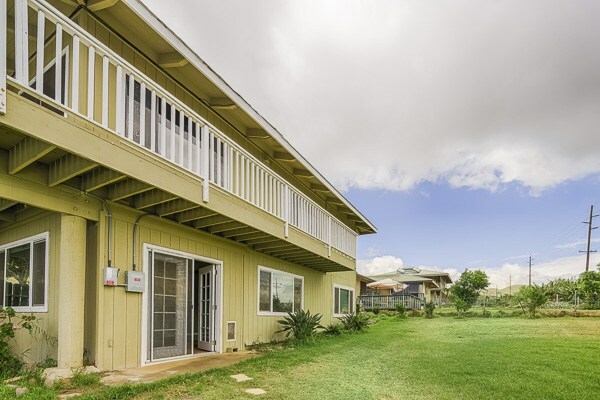 Located on the dry side of Waimea, 62-2093 Mahua St. A is in Kamuela View Estates, a highly sought after area known for its sunny days and picturesque mountain and Pacific Ocean views. 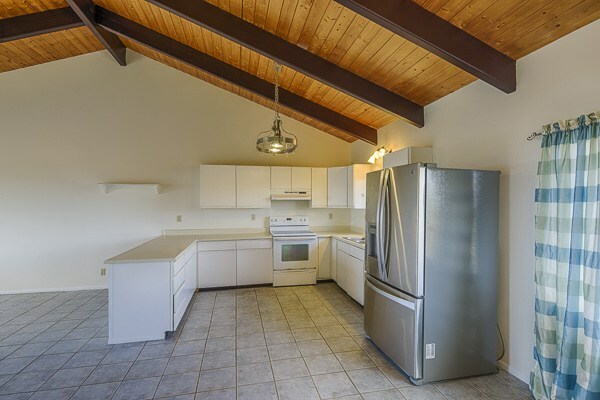 The kitchen features lots of counter space and a stainless steel refrigerator. Those sunny days are great to enjoy all the wonderful outdoor activities available on the Big Island. What’s more, Mother Nature works for you. The home includes a solar photovoltaic system, eliminating your electric bill! Vaulted wood-beam ceilings and lots of natural light lend a light and airy feel to the open concept floor plan. 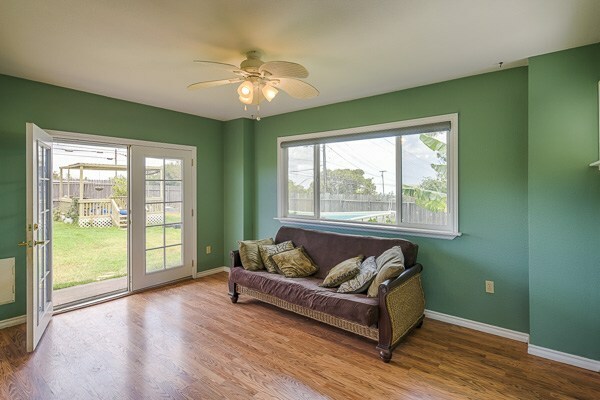 Light and airy, the two-story unit is perfect for folks looking for a Big Island property suited for living with extended family, or those looking for rental income. 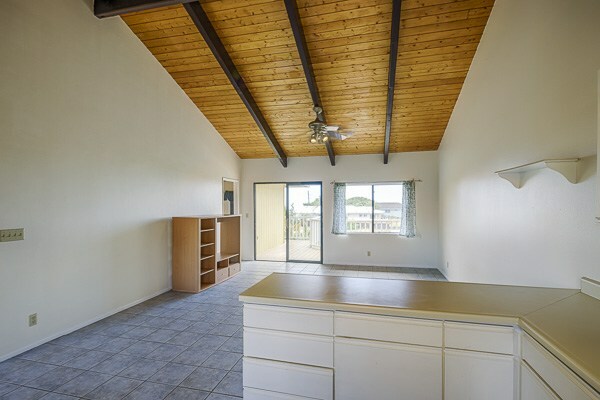 The two bed, two bath upstairs unit features an open concept floor plan with vaulted wood beam ceilings and plenty of living space. 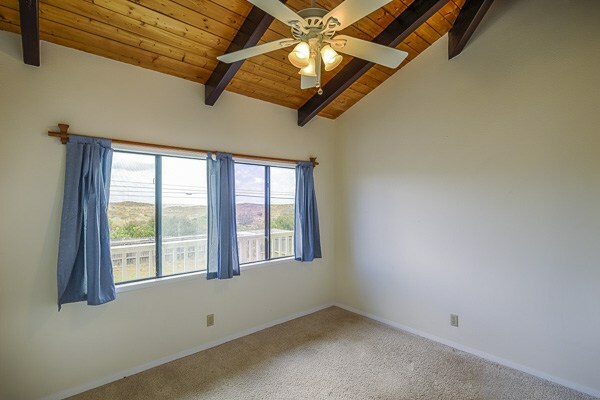 Plenty of light and space in the 2nd upstairs bedroom. Both bedrooms offer lots of natural light, and the master bedroom features a spacious walk-in closet. And there’s a covered wrap-around lanai, perfect for enjoying a cup of coffee or chatting with friends while soaking up the incredible views. Enjoy views of the Waimea countryside from the master bedroom. The first-floor one bed, one bath unit features its own private entrance, kitchen, and separate family room. A stairway connects the upstairs and downstairs unit, making it ideal for extended family or visiting guests. Or it can be used as a rental property. Family room for the one bedroom unit downstairs. 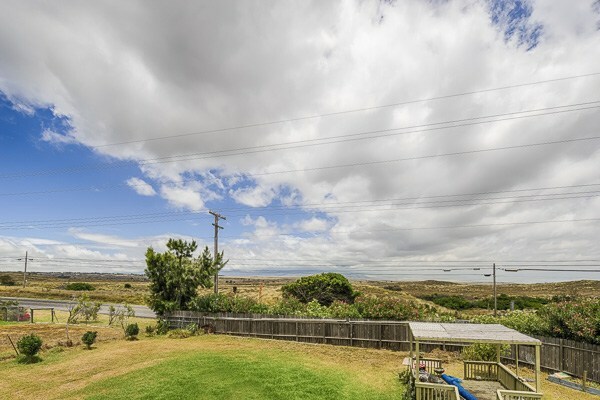 Another great thing about this delightful Waimea property for sale is the large yard. There’s a covered gazebo in the backyard – perfect for relaxing, hosting a barbeque, or curling up with a good book. Fenced in on two sides, there’s plenty of room for gardening. Waimea is known for its rich fertile soil, so you can unleash your green thumb by planting fruit trees and vegetables. 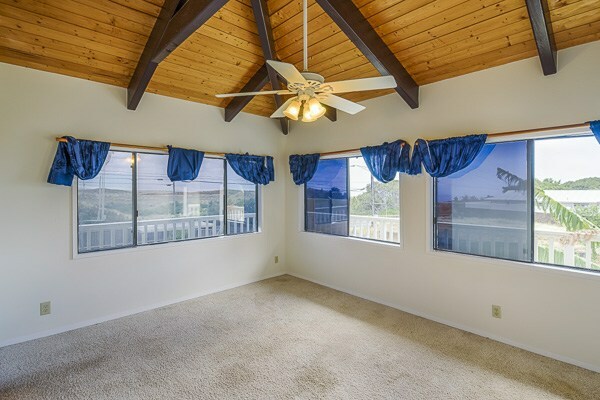 A second floor wrap-around lanai lets you enjoy gorgeous views. Offered at $375,000, this duplex has a lot to offer homebuyers. If you’d like information on this wonderful Waimea home and other North Kohala properties for sale, give me a call today at (808) 937-7246, or email me BeverlyMolfino@ElitePacific.com.